The passion of glassblowing and having our own professional glassblowing studio started back in 2004. At that time Steve Kelnhofer started making the Silver Surfer vaporizer and at that time had to teach himself how to blow glass. Back then there was no youtube, so Steve got the book contemporary lampworking by Bandhu Dunham. That was a long and slow road to gain skills as there was no one there to help guide. This is the purpose of this site so blowers today do not need to suffer the way Steve did. 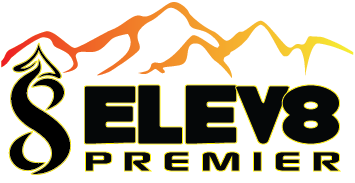 Since the inception of Elev8 Premier, we have taken a new roll to be educators in the glass field as our top blowers have more than 10 years experience. Most glassblowers are welcome to come by and trade knowledge as we like to grow as well. Today we have 10 spacious bench torch stations with each one sharing a small kiln with access larger kilns for when you go big and hard. We also have 3 lathes with our largest one being made especially for Elev8 Premier to pull color. The glass studio also features a wet room with a saw and lapping wheel. Stocked full of clear rod and tubing along with a large selection of rod and frit color. If you are in the area of Colorado Springs stop by and share some knowledge. If you are in the area of Colorado Springs stop by and share some knowledge. Custom made glass - We can make pipes, bongs, rigs or drinking cups along with many other things, just let us know. Classes - We offer beginner classes up to advanced classes. WIth some of our blowers holding 15 years under their belt, we know we have the passion and knowledge to help you grow your glassblowing skills. Studio Rental - We offer hourly, daily, weekly and monthly rental classes for your glassblowing needs. Raw glass - We also sell raw glass like clear rod, tubing and a good selection of industry colors along with colored tubing we pull in house. Learn how to make a bender back switch ball reversal with lined tubing.